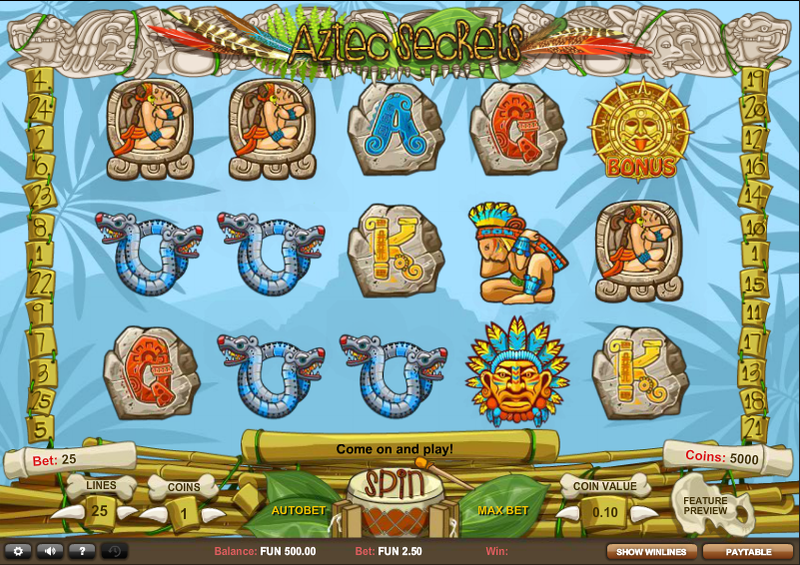 Here's a great new online slots game from 1x2 Gaming that you can play. The Aztecs settled in Mexico during the 14th, 15th and 16th centuries. This group of nomads is known for hieroglyphic writing, pyramids, their intricate calendar, and temples. The Aztecs were overthrown by Spain in the 16th century, but their culture still fascinates many today. Aztec Secrets is by 1x2 Gaming and takes players on a journey through Aztec civilization and the treasures they may have hidden. 1x2 have made this a colourful slot with beautifully drawn symbols. Aztec warriors, a female Aztec and animals feature as symbols framed in stone. The sound of a xylophone accompanies the theme and the tune builds up as you spend more time in the game causing a feeling of great expectation. The test new slot games have two features – a free spin round and a bonus round. Hailing from Brighton, UK is 1x2 Gaming which specializes in the art of simplicity. This is to say players shouldn’t expect extraordinary slot games from them. 1x2 don’t have any fancy bonuses, but their games are known for providing entertainment. Most of their games lack any jackpots, multiple bonuses, expanding wilds, and the like. Instead, expect free spin rounds. If you love promo's, get top-rated slot bonuses today. 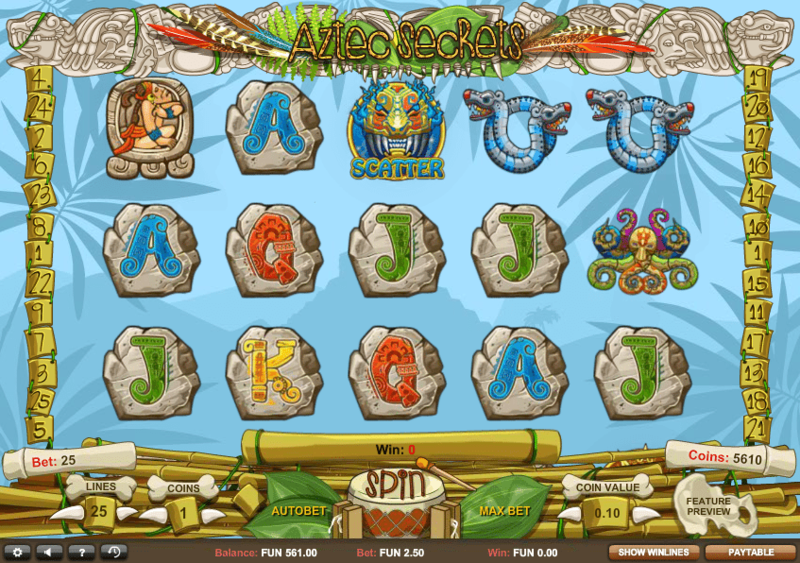 When you get into gameplay, you’re greeted by a bamboo framed slot with a detailed stone banner that has the titles. The symbols are set against a blue Aztec sky. A pyramid silhouette can be spotted in the distance. There are 5 reels and 25 winning lines. This number changes, but it’s alright if you want play on one payline. Choose your coin value and coin amount. Once that’s done the slot will automatically tell you what the total stake for each spin is. To win here you’ll land the same consecutive symbol across a win line. 3 wins in a row give you a win. Do this 5 times in a row and you’ll earn the top prizes. The highest earning symbol in Aztec Secrets is the Aztec mask. It looks like the feathered headdress from native American culture. It pays out 700x when you land it 5 times in a row. Another close earning prize is the lady set in stone who’s worth 650x. The male warrior 600x, octopus 550x and the two headed snake 500x. You complete the symbols by playing ranking card symbols from the Jack to the top. Wild symbol- The wild symbol is the golden coin. It has a smirking golden face and tiny colourful masks making it easy to spot. It substitutes any other symbol except bonus symbols or scatters. Keep an eye out for it on reels 2, 3 and 4. Scatter symbol- There are two scatter symbols. The first is set against a terrifying warrior who wears a golden mask. It doesn’t behave like your typical scatter. Players need to land it on a pay line 3 or more times and not anywhere else on the slot. After you succeed, you enter the bonus game round. The second scatter is the bonus. It’s set on a quirky sun with its tongue sticking out. If you land 3 or more of these on a winning line, you activate the bonus round. Free spins round- Here any of your winning amounts can be doubled with the 2x multiplier. Bonus round- You stand to win big prizes in the bonus round. You’ll need to work for them by maneuvering through five rows of stepping stones to get to your prize. If you make it all the way to the end of the 5 rows and see the large stone figure, you’ll activate a hefty cash prize. You’ll have a fun time exploring Aztec Secrets as you win yourself cash prizes in this game. The graphics in the game are well-done as compared to previous creations from this developer. The background sound fits the game so well. It doesn’t have a huge jackpot or graphics to die for, but if you have a few minutes to spare this should be an enjoyable slot game for you.